Microgaming first announced the launching of new games on its Bingo, Quickfire and Flash platforms on April 2011. The Flash and Quickfire games will be available by April 7, while the Bingo titles will be launched on April 20. The press statement defines Mayan Bingo to be a new approach to playing bingo. Styled with the culture of the South American variant, it challenges players to pair the numbers on their cards with a certain set of number patterns that has an equivalent prize. Those who could match an entire card on the initial 28 balls drawn wins the jackpot prize of 50,000 his bet. The game invites players to take a break from the ordinary and offers them a chance to purchase as many as 10 additional balls so they can complete a pattern. Another game slated to be released is Electro Bingo. Obviously, it has an electric theme and will cater to those who enjoy a fast-paced action pack gameplay. It has similar mechanics to that of Mayan, but the grand prize isn't as big. Thirty balls are needed to complete the card. If a player can do this, his bet will be multiplied 20,000. Those who only lack a single ball in order to complete the claim the prize can purchase one. 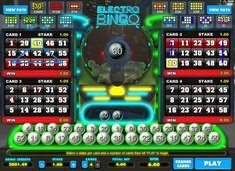 Electro Bingo would also be offered in appropriate platforms in flash and casino like in Lucky Nugget and Jackpot City. Players will not be limited to one bingo card; they can have as many as 4. They can select the number of cards they want to use at the betting area found on bottom part of the screen. Click on the cards to activate or deactivate them. After placing your bet, the game will commence. Thirty balls will rapidly show up on the screen. If any of the ball's number matches your card, it will be highlighted. The prize will then depend on the pattern you got. As mentioned earlier, Electro Bingo has an advantageous feature for players. It allows them to purchase more balls when they are about to form a winning pattern. As many as 10 balls can be purchased additionally. We also recommend trying Slam Funk by Microgaming for something truly entertaining.